Pay per Click or PPC is a process of internet marketing used to direct the traffic to a particular web site. It basically uses search engine advertising for generating the required number of clicks organically. The sponsored ads on the social media sites fall under this category. 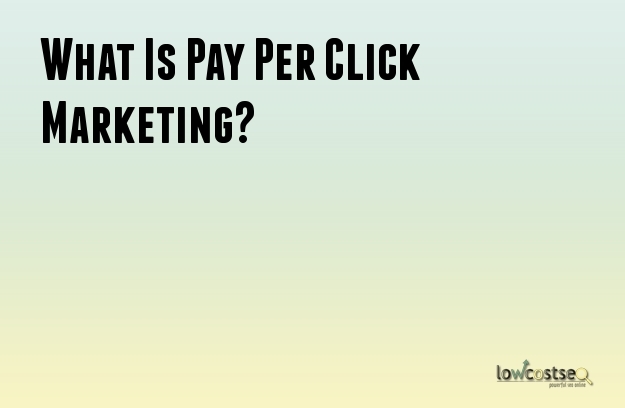 When a customer clicks your sponsored ad and visits your web site, you pay a sum to the search engine, hence the name pay per click. This might sound expensive at first, but if your campaign is good and you are able to generate good sales, the amount you have to pay becomes miniscule as compared to the profit you earn. Growing your customer base: Internet is a huge platform and there are thousands of potential customers out there. If you are able to target you audience effectively you will be able to generate more sales. If your sponsored ad catches the attention of the potential customers, they will visit your web site increasing the page traffic. If you products are attractive and good, they will make purchases and you will be able to make huge sales and profits. ·Useful for searchers: Google has developed an algorithm that filters the pay per click ads in accordance to the search history of the user. If the user’ search history shows a lot of fashion and lifestyle products, the relevant ads will pop up on his social media account narrowing the search for him. ·Useful for search engines: The customers use the search engine for looking for the relevant products and services. With the PPC, the search engines are able to provide their users with the exact thing that they are looking for. The search engine is able to provide relevant results which are revenue based at the same time. Flat Rate PPC: In this the publisher and the advertiser agree on a fixed rate to be paid with every click on the advertiser’s web site. In this case the publisher usually has a certain rate card of charges depending on factors like content, area, etc. ·Bid Based PPC: Here the publisher hosts an auction where the different advertisers place bids for the particular ad spot. Google AdWords is the most popular of all the PPC platforms. It basically works on the basic pay per click system where the advertisers pay for each click the customer makes on their web site. When the customer searches Google with certain keywords, Google displays the relevant Ad Words ads on the sponsored area. There is an advertiser’s ad rank that decides which advertisers get the top spot on the pages. The rank is decided on the basis of what the advertisers are paying (CPC bid) and the total quality score of the particular page like relevance, landing page, etc.